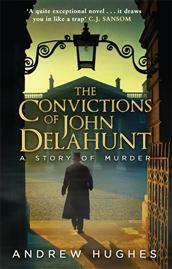 It took two years to get my first novel finished and honed… I wrote pretty much all of The Convictions of John Delahunt through an historical fiction workshop with John Givens. John’s brother David runs Liffey Press and had published my social history of Dublin, Lives Less Ordinary. The book has to be as polished as possible before sending it out… I jumped the gun with one agent and sent it out when it was half-done. She liked the first 10,000 words and wanted the full manuscript but the book wasn’t ready. It was a mistake because then I had to put her off. There was a sense that I was wasting her time. You have to make sure the book is finished, edited and fully complete before you start looking. I posted an excerpt of my novel… on the HarperCollins website http://www.authonomy.com. The feedback I got was very encouraging and a member of Authonomy tweeted about my novel. Sam Copeland, an agent with RCW, spotted the tweet and said it sounded interesting. So when I had finished the book, I got in touch with Sam again and he took me on. He suggested a couple of small edits to the novel, and then sent it off to all the editors he thought might like it. Three or four publishers expressed an interest… so even though rejections were coming in, Sam was pretty confident we were going to get a deal with somebody. I was broke at the time… I was painting houses to make money. One day, I was in my overalls, daubed with paint, a roller in my hand when my phone went. It was Sam letting me know that an offer had come in from another publisher. A few more offers came in that day, but in the end Transworld outbid the others. There I was in my painting gear… saying ‘Sam, take whatever deal is on the table!’. He was a bit more level-headed and steady. I thought I could throw away my paint brushes… but I was surprised by how long it took for the deal to be finalised and the contract signed. There was a lot of back and forth between RCW and Transworld over the fine print in the contract. It took four or five months. In the meantime I was scraping by. I signed a two-book deal… I wouldn’t have been able to get the deal without an agent. There’s no way you’d get your book in front of the right people. And it’s not just the deal. Sam is great to bounce ideas off. Transworld’s editor Simon Taylor came over from London… and took me out for lunch with two editors from Transworld Ireland. It was great to actually meet the publishers. There was lots of talk about the book, and lots of sparkling wine, and when we finished lunch I showed them around Dublin Castle. Simon came over again for the launch, and when I was short-listed for crime novel of the year at the 2013 Irish Book Awards. It was nearly a year before the book hit the shops… from the time the offer came in. It was published in September 2013 and on the day it came out, I went into Dublin city centre and went around all the bookshops and there it was. In Dubray’s on Grafton Street there was a full shelf just inside the front door. I was delighted. I went in and bought a copy. I’m writing full-time now… working on my second novel. It’s another historical fiction book, this time about a young lady sleuth, the coroner’s daughter, set in 1816 Dublin.